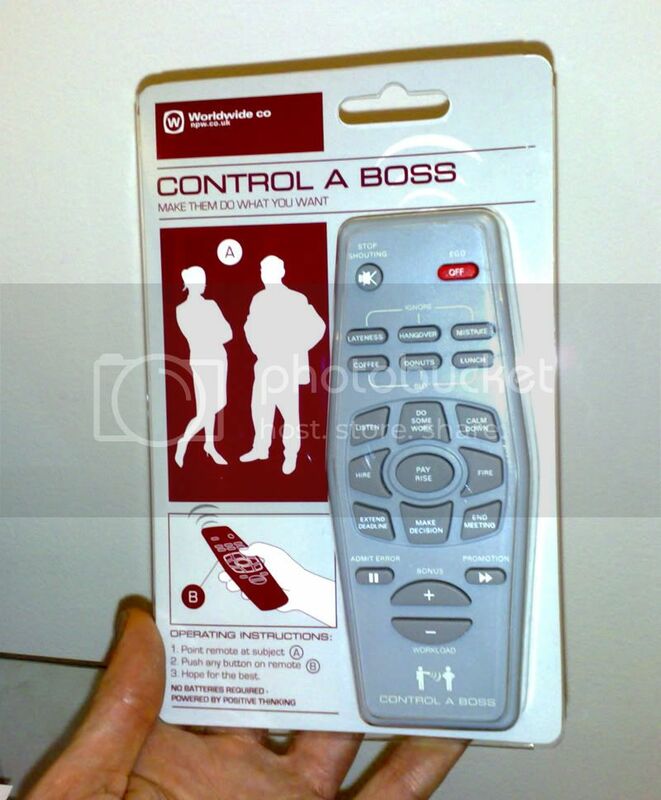 NEW PRODUCT OUT: The CONTROL-A-BOSS remote! Economists, City Insiders and even Governments are today reeling after the launch of a brand new piece of technology set to revolutionise the way we work. Today sees the release of the CONTROL-A-BOSS remote control, an invention from Author, Comedian & Entrepreneur, Sheridan ‘Shed’ Simove. The CONTROL-A-BOSS remote has buttons and functions designed to control a Boss’s actions, including ‘IGNORE LATENESS’, ‘MAKE DECISION’ and most worryingly for the Economy, ‘PAY RISE’. Creator, Simove, who’s latest book ‘IDEAS MAN’ charts the birth of his remote control range, explains how the CONTROL-A-BOSS came to be made. “No one likes being told what to do by their superior…”, Simove says, “So I thought I’d make a remote control to help all the wonderful workers out there…”. Markets crashed around the world as news of the remote reached international sectors. Global recession looked a certainty, until a Business Student from Nottingham pointed out that the remote control doesn’t actually work.